We will be addressing top scrubbing procedures for the topic of how to clean a tile floor. 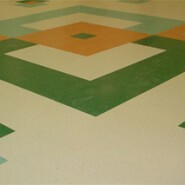 It is a critical step in the total maintenance of floor care and floor cleaning. There are several reasons for top scrubbing a tile floor. So the goal of this article is to provide our readers and visitors with the proper steps on how to clean a tile floor for deep cleaning. As stated above, there are different reasons for why top scrubbing a tile floor is necessary. The 2 most popular to reasons to top scrub a tile floor is as follows. To remove heavy soil built up in the tile floor. This is a part of regular cleaning maintenance. To clean the upper layer(s) of the floor finish (wax) to prepare it for a top recoating of floor finish (wax). It is critical to remove the built up soil impended into the floor finish. Otherwise the soil which already trapped into the floor finish will remain under the fresh recoats of floor finish. The dirty or soil will show through and this dirty appearance will detract for the appearance of the floor by resulting in not only a dirty appearance but also a yellowish or gray color to the floor. Prepare and stage all necessary tools and equipment. Fill automatic scrubber with cleaner solution that is diluted according to label directions. Attach Red or Blue Scrub pads to the automatic scrubber. Fill rinse buckets with clean rinse water. In a bucket, mix water and Floor cleaner according to label directions. Dust mop entire floor area and remove gum, labels and foreign debris with putty knife. Post “Wet Floor” signs and/or barricade area with CAUTION tape. Generously apply from the bucket with a mop the floor cleaner solution to the edges and borders of the floor area as well as all hard to reach areas. Allow 10 minutes dwell time. Using a doodle bug pad, scrub along the edges and borders and up against unmovable fixtures to deep clean the Floor Finish and/or sealer. Pick up Floor Cleaner solution from the edges and hard to reach areas with a mop or wet vacuum. Rinse with clear water and allow to floor area to dry. Using the automatic scrubber with red or blue scrub pads, make two passes over entire floor area, overlapping edges and borders that on been previously scrubbed manually with the doodlebug pad and mop. The automatic scrubber solution valve should be in the FULL OPEN position. Pads should be down but squeegee should be up and vacuum off. Special note: Deep Scrubbing speed for this procedure should be half (50%) of normal daily scrubbing speed. Upon completion of the first pass, engage squeegee and vacuum. Pads should remain in the down position and solution valve should remain in the full open position. Make a second pass with the automatic scrubber, picking up floor cleaner solution from the floor. Again, deep scrubbing speed for this procedure should be half (50%) of normal daily scrubbing speed. Using a rinse bucket and mop, pick up any trails and turnaround puddles that may have been left by the automatic scrubber.